The Best Western Emerald Beach Resort is located on the Caribbean oceanfront of St. Thomas. Best Western is famed world-wide for its spectacular service and accommodations. This Best Western lives up to its name, and provides you with the Best Western you know in a paradise of your dreams. This beach resort is located a few minutes from the airport, and only two miles from downtown Charlotte Amalie. The Emerald Beach Resort is known for its Polynesian architecture that gives the resort a romantic ambiance. 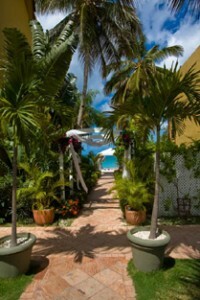 Many Caribbean honeymooners and large business parties find this hotel to be the perfect location for large gatherings. Stay in one of the rooms, all of which feature a private balcony that allows you to fully enjoy your oceanfront view. Traverse the verdant gardens and take pleasure in the cascading waterfalls that are spread throughout the resort. Dine at the Portobello, the resorts beachside restaurant and bar which features live music and a scenic Caribbean view. The Best Western Emerald Beach Resort offers affordable prices for a location that will make your Caribbean stay and unforgettable experience of fine dining, shopping and entertainment and pure vacation bliss.